Get ready to dance yourself dizzy, or whatever itis you like to do before switching on our favourite egg-shaped hero, because he's back with a vengeance in the latest blast to add to your collections. 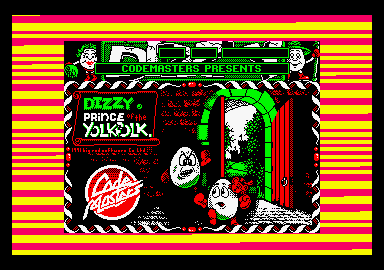 Taking the lead role in yet another superb compilation of Dizzy escapades, Prince of the Yolk Folk is a superbly crafted adventure in true Oliver Twins style, which is guaranteed to have you biting your toenails off within a matter of minutes of switching your computer on. Jam-packed with puzzles and conundrums, your task is to save the King's castle, as well as his beautiful daughter, from the wicked ways of the evil troll Rockwart. The good king has wandered off to the Crusades somewhere, leaving his domain open to Rockwart's advances. You, Prince of the Yolk Folk, must save the kingdom from a fate worse than death, though it's going to take every ounce of your grey cells to get you into the castle, let alone finish off Rockwart. Now, that old scenario of King gone to crusades and wicked person (or troll) taking over kingdom sounds a little familiar, don't you think? Absolutely, little Dizzy has got a real streak of Robin Hood in him, well-timed to coincide with the current movie scene and the host of Robin Hood toys that will be sure to abound in the toy shops this Christmas. That aside, Prince of the Yolk Folks is a totally original blast, totally enjoyable and featuring masses of hidden extras which will need to be fathomed before you can get to the root of the problem in hand. Talk to everyone you meet to gain invaluable clues, and be sure to help out those in need, as they will be sure to return the favour when you most need it. Take care at all times as to what you are carrying, and keep your eyes peeled for the life-giving cherries. Remember, Dizzy can't swim, so you ll need to find something to pay the Ferryman to get across the Styx, and be careful at the perilous leaps over water, or Dizzy could well end up getting very damp. 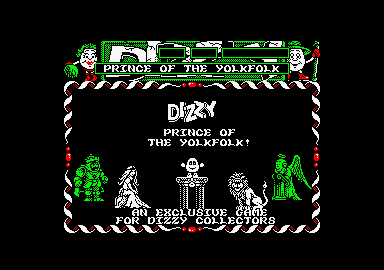 Superbly crafted, with excellent graphics and sound effects, Prince of the Yolk Folks will prove to be a vital addition to your Dizzy collection. Only available on this special compilation, you can't beat it for value for money. 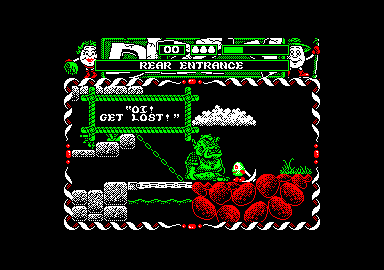 Joining the all new Dizzy bash on the collection is Dizzy Panic, the last Dizzy outing which also proved to be a chart buster. Helping Grand Dizzy to fix his toy making machine is no picnic, especially as the hydraulics are getting closer and closer at all times. You'll have to be extremely quick to help Dizzy out with this one, so keep your eyes open, match up the falling shapes and be sure not to miss a thing, otherwise it's curtains for you and the machine. Just make sure the chutes stay as high as possible, and keep creating the toys to earn the high scores. 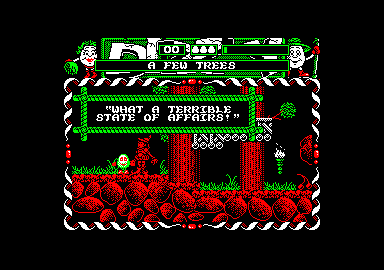 Three more Dizzy offerings complete this outstanding compilation so, if you like your adventure hard and fast, you know just where to come. 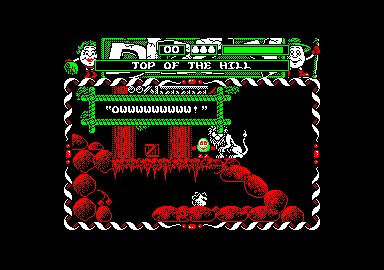 Ifyou haven't had a go at the early bash, Spellbound, then you don't know what Dizzy is all about. The same goes for Bubble Dizzy, two totally brilliant and zany offerings that are guranteed to keep you glued to your screen for many an hour. Again, you'll need all of your wits about you to complete these classics, even though many of you will probably be up to your ears in cheats and pokes forthese Dizzy blasts by now. Judging by the numérous calls to the Dizzy Helplines, however, it seems that there are just as many of you who are still stuck somewhere or other. Not to worry, I'm sure youll find more clues inside this mag at some point in the near future. Finishing off this all-round Dizzy bash, is the excellent Kiwk Snax. Kidnapped by the angry Wizard Zaks, the yolk Folk are trapped in the land of Personalities and only you can save them. Divided into four separate islands, you must complete the five levels on each to rescue a friend. Be warned, however, each island is teeming with Zaks'henchmen, and they mean you no good at all. Cool Denzil has been left out in the cold in the Land of Ice, Dylan has been left to doze in the clouds, Grand Dizzy is in the hands of the clocks and giant teddies in Cuckoo Land, and poor old Daisy seems to have got the roughest deal of them all, trapped in Zaks'dungeon and guarded by his best henchmen. Along your route, keep your eyes open for special bonusses in the form of fruit. Collect the fruit in the order they are flashing for extra special awards and take care to watch the special features that fall from the sky. Some help, but others do not. Pick your island, dodge around the stationary blocks and be sure to push the sliding ones into the path of the henchmen to gatheryour fruit in this superb blast . At the end of each level, you musttake part in a special bonus challenge. It's slippery, it's slidey, and it's very, very difficulttogetyour bonus. Fighting against the clock, move off and you'U find you won't be able to stop until you hit something. Make sure you plan your moves well in advance to make it before time runs out, otherwise you could end up with a very sore head, indeed. 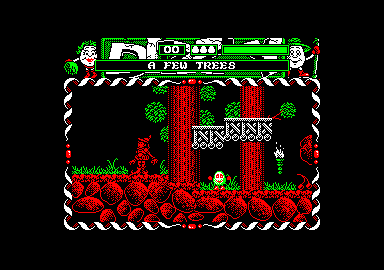 What more can you really say, each of the Dizzy games are best-sellers in their own right, and have always proved incredibly popular with young and old gamesters alike. 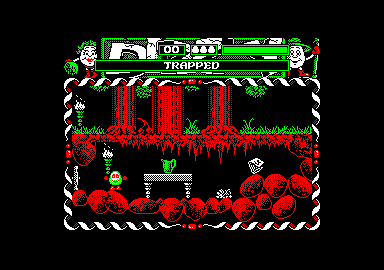 The new Dizzy blast looks every bit as good as its predecessors and heads up this compilation to make it a corking good buy for Christmas. Each featuring stunning graphics and totally addictive gameplay, this is one compilation well worth queueing up for when it hits the shops.